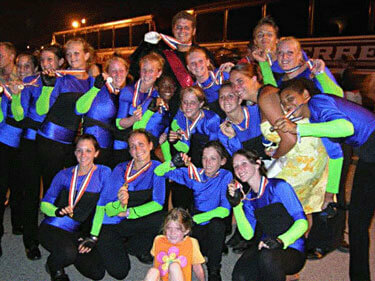 This picture is from Adam Billings, Dutch Boy's drum major in 2005. This is a picture that was taken the night of Division II & III Divisional Finals. We as a corps were very happy to have made finals. Dutch Boy had not made finals at DCI for almost a decade. In this picture, we have our color guard caption head Leigh Hadjis (right side), most of the color guard and one of our member's sisters sitting in the very front. It truly was an exciting week for Dutch Boy. We would like to thank our staff, for without the time and effort they gave to us, we would not have gotten as far as we did. Thank you from the bottom of our hearts. Every show while we were out on the field, we gave each of you a piece of our hearts and you gave us a piece of yours.